You can control Roamer from many different software packages. The basic RoamerWorld package is free to Roamer User Group members. You can add to the functionality of RoamerWorld by downloading further freemodules, purchasing premium modles or linking to other software packages. 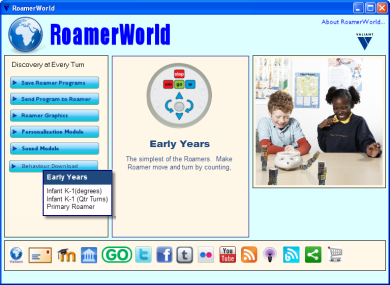 RoamerWorld can launch all programs that work with Roamber. RoamerOverview from Dave Catlin on Vimeo.